Rather busy with school trousers hems and sewing on name tags since my last post. Didn't distract from my projects though - knitted a further baby gator so I could send 2 to my friend for her anniversary this weekend. This was at the in-laws house over the bank hol. 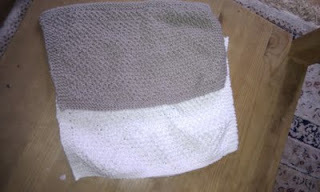 Also whilst there used up the remnants of the DB yarn making two face cloths but now think garter stitch in stripes would have been better since both face cloths are rather small - DH's comment was "but its not square". The rather gorgeous reverse double moss stitch was lost on him. Back to work a fortnight and found half an hour before returning to our borrowed nanny & the kids to peruse books in the library - what a delight. Haven't mentioned before that I adore books. Just loving The Gentle Art of Knitting by Jane Brocket. I share her ethos entirely. What an inspirational book! Wonder how long I can renew it electronically before it gets reserved. The front cover looks rather trad but its bang up to date published this year and even summarises blog trends. Impressive. She also has a pattern for crocheted granny squares which ties in with recent project - increasing the size of my granny square cushion cover..... will devote next post to that.